It's said this 170-ft.-tall (50 m) water tower could hold up to 640,000 14 oz. bottles of ketchup. The Collinsville, Illinois water tower was built in 1949 for the G.S. Suppiger ketchup-bottling plant, bottlers of Brooks Rich & Tangy Ketchup. 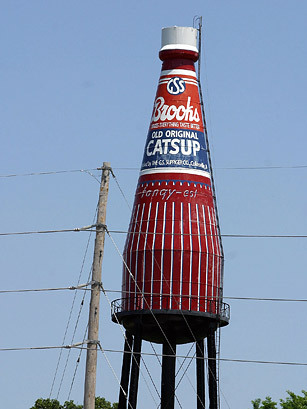 It reads catsup after the original Brooks bottle. Brooks left the town in the 1970s, but the well-loved bottle remains. It's so cherished, in fact, that the town gathers each summer to sing it "Happy Birthday" at the annual Catsup Bottle Festival. The daylong event features a ketchup tasting, a water-balloon toss, a hula-hoop contest, a (smothered in ketchup) hot-dog-eating contest and a contest to crown kids as Little Princess Tomato and Sir Catsup. See TIME's list of the top 10 quirky local festivals.